This is a colorized sculpture postcard featuring the handiwork of Italian artist Mastroianni. His preferred art medium was clay but he got into the postcard craze, moved to Paris at the turn of the century and set up shop to have photographs taken of his 3-D bas relief designs. The postcards were usually printed plain, in sepia or black and white. This one has been delightfully colorized (not by me, this is all original, printed in Italy and mailed in 1916!) Lovely flowing lines in the woman's dress. Very art nouveau! 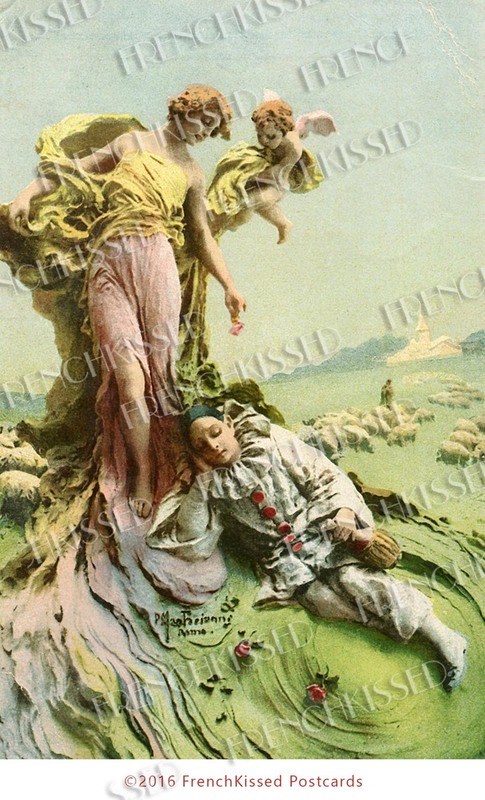 The title of this piece is "The Dream of Pierrot." Although I enhanced and cleaned up some specks and spots, you'll notice that I left the creased corners at the top for that authentic shabby chic, aged look. Now, my original postcard is for sale in my other shop. When it sells, this digital scan will no longer be available. I only sell scans of images I own in my personal collection. So if you love it, grab it now! You'll receive an email with a link to the download (Photo No.1). It's easy peasy!